The number of foreign visitors to Japan in 2012 surged 34.6 per cent from the previous year as the tourism sector rebounded after the 2011 tsunami and nuclear disaster, the government said this month. Overseas arrivals totaled more than 8.3 million, just short of the record 8.6 million seen in 2010, the Japan National Tourism Organisation said. This entry was posted in Japan on 2013/01/28 by Trailsurfer. The Nine Hours capsule inn provides the ultimate solution for a city where space is at a premium; a hotel room that is, literally, a capsule. While the inn provides a public lounge space, including bathrooms, guests stay in a reinforced plastic capsule unit, which have all the usual amenities, such as TV, radio, lighting, and alarm clock access. This entry was posted in Japan on 2011/11/08 by Trailsurfer. 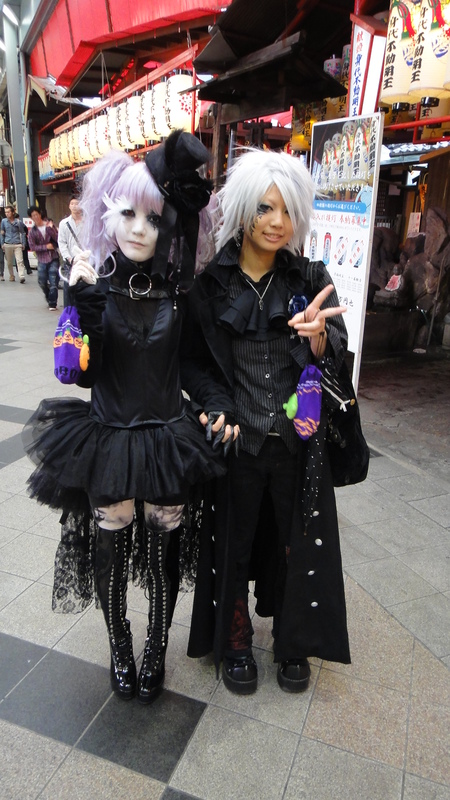 The Japanese are true masters when it comes to street fashion. During the Halloween weekend we went out to capture some of the outfits that decorate shopping malls and subway stations. 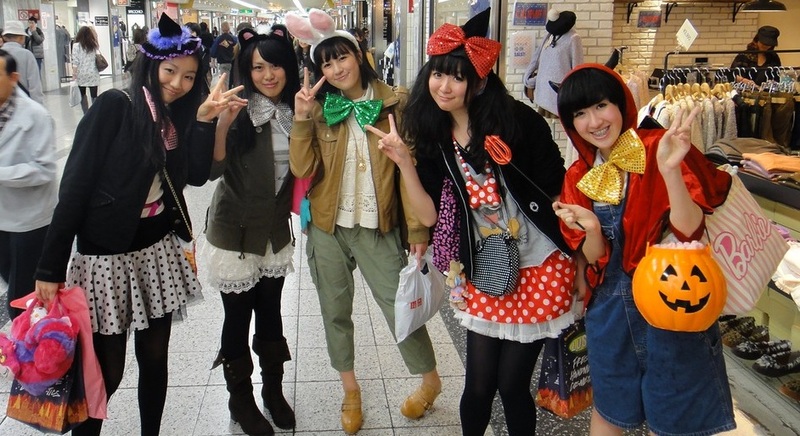 When we dress up we usually go to a party but the Japanese dress up for Sunday shopping with friends. It is truly an inspiration to watch these very brave girls and boys as they with great confidence walk around the streets in their home-styled outfits. These girls were standing and waiting for a green light at a street crossing. They are just out and about on a Sunday. 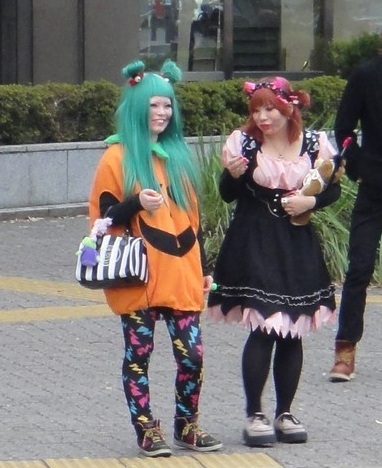 We caught these two girls walking around in a shopping mall handing out Halloween sweets. A group of young girls heading for one of the large shopping malls in Nagoya. This entry was posted in Japan on 2011/10/26 by Trailsurfer. To kick-start tourismen Japan is proposing to give away 10.000 free flights. Potential visitors will be asked to submit an online application for a free flight, specifying which area of the country they would like to visit. Successful applicants will then be asked to write a review of their trip, which will be published on the internet. The plan is still at the proposal stage, and is subject to government budget approval – but could start by April next year. This entry was posted in Japan on 2011/10/12 by Trailsurfer. Typhoon Talas, which made landfall on Saturday and is one of the deadliest in recent years, packed gusts of up to 108km/h as it cut across the island of Shikoku and the main island of Honshu. 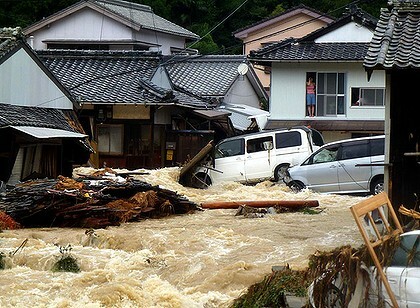 In Wakayama prefecture, 12 people were killed and 29 were missing. In Nara prefecture’s Totsukawa village, an overflowing river washed away apartments, leaving at least two people dead and seven missing, the local government said. In the Kansai region and elsewhere up to 30,000 people were evacuated, according to the fire and disaster management agency. Tourists in these areas should head for the nearest emergency evacutation center and notify their national embassy. This entry was posted in Japan on 2011/09/04 by Trailsurfer. 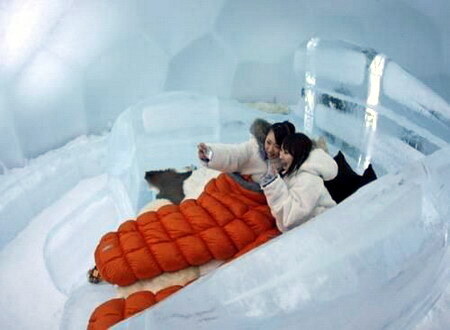 Japan has built a Ice Village at Alpha Resort in Tomamu, Shimukappu. 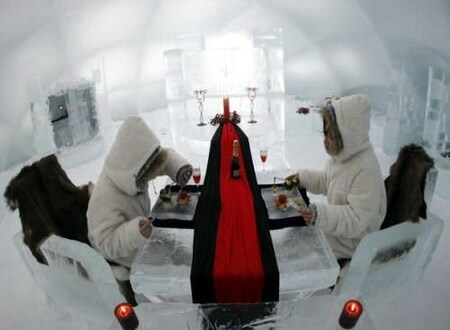 The hotel’s dining room, bedroom and bathroom are made out of ice, with a room costing $1,375 for two per night, with dinner served on an ice plate. Guests sleep dressed appropriately , in layers and thick winter jackets. Here is the original Ice Hotel in Sweden. This entry was posted in Japan on 2011/08/28 by Trailsurfer.